Yes - Sign Me Up Now! We are based in Ashford, conveniently situated within a short drive of both Gatwick and Heathrow airports and within 10 minutes of the M25, Jct 11. The Heathrow Express coach stop is a couple of minutes from our base or we would be pleased to arrange transfers for you and your luggage from the airport to the motorhome. 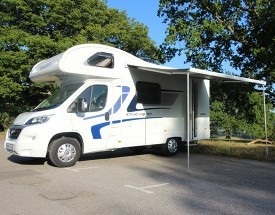 Otherwise, you are welcome to leave your own vehicle with us for the duration of the motorhome hire. 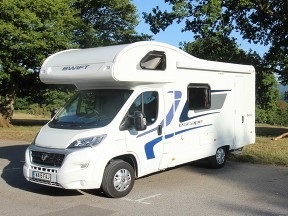 We are the proud owners of this beautiful new 2015 Swift Escape 624 motorhome, which is a 4/5 berth vehicle with safety belts for the driver and 5 passengers. All the seatbelts are full, three point belts. 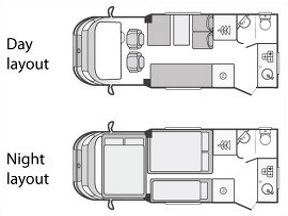 There are two in the cab area, then in the rear, two forward facing and two rear facing. It features a spacious living area in the front of the vehicle, with a generous U-shaped seating area offering plenty of room to stretch out for four, or to welcome friends. The side-facing settee is a huge 6’1” long invitation to sit back and relax. Sleeping accommodation is flexible: there is a generous double bed over the cab and the central lounge area can be configured to provide 2 single beds, a double and a single, or super-king sized sleeping area. The rear kitchen area has a 3-burner hob and gas oven, a large fridge and a microwave (works only on 240v hookup). It is well-equipped with everything you need to self-cater on your holiday and benefits from a handy additional worktop space on both sides of the doorway. There is truma blown air heating and hot water system to keep you snug on chillier evenings or off-season holidays and flyscreens, blackout blinds and curtains throughout. The generous water and waste tanks mean less time spent on chores. There is a sun canopy and comfy outdoor seating. 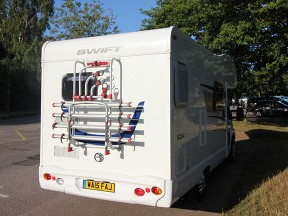 We have equipped the motorhome with everything we think you might like to make your holiday the best it can be. If there is anything you need that we haven’t listed, such as pup tents, child car seats, sports equipment, do contact us and we will do all we can to help.